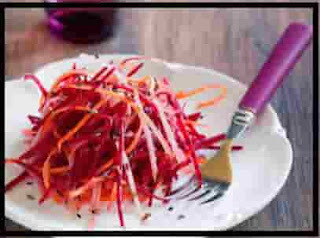 · Boil the beets in the boiling water until it is soft and then let it cool for a whole night, then cut it into semi-sliced slices. 1. In a bowl, mix lemon juice, olive oil, honey, cumin, coriander, cinnamon, hot red pepper, spoon, and salt. 2. Cut the beets into thin slices and place them in a bowl. 3. Cut the carrots into thin slices and add them to the beets. 4. Add parsley and sauces. Mix the ingredients until they overlap and give the power at room temperature. Add pomegranate seeds to this salad for more nutritional value.